The Petrel Link module allows you to connect the display of data in Insight with that which is displayed in Petrel. Once connected, you can control the cursor and navigation from Petrel for display in Insight. Any change on the project unit on the Petrel side during the "connected" status will be directly detected and updated in Insight. In addition, you can also view data from Petrel in Insight when both applications are linked. This feature allows you to read data that are saved in Petrel from Insight. See Insight and Petrel for a list of data that can be shared. Once shared, you can then create local copies of the remotely linked items in Insight and make changes to the local copies (see Create local copy below). Once you have created local copies, you can synchronise the edited items to Petrel (see Synchronise Data). The Petrel Link supports Petrel versions from 2012 to 2018. Note: There is no conversion of units across the link. If the project X/Y units are different, then the Petrel Link will fail to establish a connection. Project units must be the same. There is also no CRS conversion across the link. In this situation, we recommend transferring data into a new Insight project to preserve the native CRS, and then importing data from that new Insight project to the end Insight project (of a different CRS) performing a CRS conversion as you do. Tip: Polygons exported from Petrel can also be imported into Insight (see How do I export Polygons from Petrel to DUG Insight?). Open an existing project or import resources into a new project. Open an existing project or import resources into a new project. You are advised to view data from the same project in Petrel and Insight. For example, load a set of near, mid and far stack seismic volumes in Petrel, and in Insight, load the corresponding gather volume. Open the Links tab in Insight. Expand the Petrel Link Settings panel. Click Connect to link to Petrel. The connection status will show as "Connected". Select the Update cursor from Petrel check box to synchronise the cursor (green crosshairs) in Insight based on Petrel’s Select/Pick cursor. Once this is enabled, you can use Petrel’s Select/Pick mode in any view and the current X, Y and vertical co-ordinates will update Insight’s cursor (green crosshairs) in real time. Select the Update navigation from Petrel check box to synchronise the navigation markers (red crosshairs) in Insight based on the selected inline and crossline locations in Petrel. Once this is enabled, the current inline and crossline locations in the active interpretation window in Petrel will update Insight’s inline and crossline locations in real time. Note: If there are multiple inline and crossline slices for a seismic cube in Petrel, only the coordinates of the currently displayed slice and the first intersecting slice are updated in Insight. For example, if Petrel’s interpretation window is displaying inline 1000 and two crossline slices; 1500 and 1750 in a seismic cube, Insight will display inline and crossline coordinates of 1000 and 1500. Once connection is established, the Manage Resources button will be enabled. Click on the button and the Manage Remote Resources window will be displayed. Note: If there are multiple users sharing a workstation, each user will get their own isolated instance of the link. If the data that appears in the Manage Resources window is not the project that you intended to link, see Why is the Petrel Link showing me a different project after connecting? Click an item tab (Volumes/Horizons/Faults/Wells) in which you can select the items from Petrel and link them to Insight. Expand the folders to view the list of items in Petrel. Select the check boxes to choose the items that you want to link to Insight. In the example, all wells in the "Wells" folder will be remotely linked to Insight. Take note that data is read from the remote application and not copied to the disk. Note: When loading remote data in Insight, the system will create a new survey if there is no local survey that matches the data found. If certain items have been added or removed from the Petrel project, click the Reload button to refresh the information that can be linked. The Reload button updates the display of the Manage Remote Resources window. 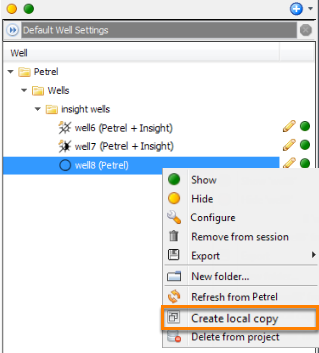 Note: Similar to a database well in Insight, you can also select multiple checkshots and marker sets for wells linked to Petrel. In addition, Insight will fall back to a straight deviation for a well if it cannot load the remote deviation file. 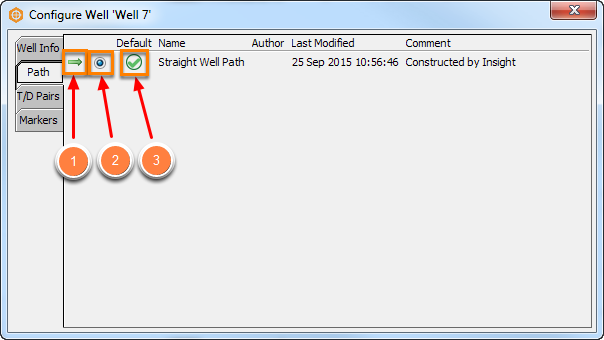 After linking wells from a Petrel project, double click the well in Insight to open the Configure Well window. Click on the Path, T/D Pairs and Markers tabs to choose the deviation, checkshot and marker to use. Items that are remotely linked will be listed in the tree and indicated as "Petrel". In order to edit this item in Insight, you should create a local copy in Insight. Click Create local copy. Insight will then create a local copy of the remote item. This item will then be indicated as "Petrel + Insight". Note: Insight attempts to match the volume compression settings used by Petrel. The error message above is displayed when Insight notices that the Petrel software is closed (either on purpose or involuntarily) before the Petrel Link is disconnected. If it happens when the user is performing an operation, there is a chance that the Petrel and Insight projects will be out of sync. To avoid this message, and any loss of data, we recommend disconnecting the Petrel Link via the Links tab in Insight before closing Petrel.